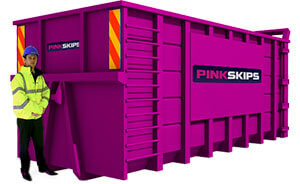 Pink Skips continually invests, innovates and evolves our waste processing plant and processes. Offering our customers a cost not only effective but also environmentally responsible solution to their waste management requirements. We presently achieve a recycling rate of 99.54% when handling mixed construction waste. Ensuring optimum landfill diversion. Backed by the expertise of P.B Donoghue Group with over 40 years industry experience. We offer the assurances that all your waste is handled and disposed of in line within the most stringent legislative requirements. With safety, and sustainability always at the forefront of what we do. Our prices are competitive and we pride ourselves on great service. 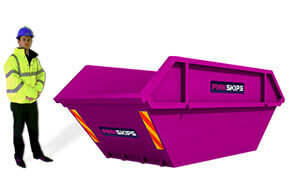 Be sure you know how to use your skip safely, and to ensure we can take away your waste. Pink Skips uses SSL encryption, so your information is safe when you order. 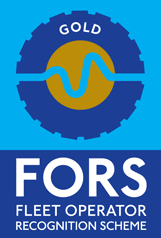 We also offer Grab Hire, Tipper Hire, Aggregate Supply and a Caged Lorry Wait and Load Service.